ASPI recently published an anthology of pieces  about the ruling by an Arbitral Tribunal established under the UN Law of the Sea Convention (UNCLOS) to deal with the dispute between China and the Philippines in the South China Sea (SCS). Those articles were written within a few weeks of the ruling. Now, some two months on, it’s useful to assess the impact of the ruling, particularly in the light of recent ASEAN meetings and the East Asia Summit held in Laos. Despite pressure from the United States and Japan , the recent regional meetings didn’t mention the arbitral ruling in their closing statements , indicating the influence China enjoys within the region. It also suggests that while Southeast Asian countries want the United States to remain in the region as a balance to China, they’re rather less supportive of more challenging moves by Washington. Australia has called on the Philippines and China  to abide by the ruling as final and binding on both parties. Australia became one of only seven countries  to formally call for the award to be respected, along with Canada, Japan, New Zealand, the Philippines, the United States and Vietnam. Southeast Asian countries other than the Philippines and Vietnam have opted to ‘sit on the fence’. Adding to Australia’s response, the Foreign Minister later joined with her counterparts in Japan and the United States to express serious concerns over the disputes in the SCS, and to voice strong opposition  to any coercive unilateral actions that could alter the status quo and increase tensions. Those reactions by Australia strained our relations with China, provoking a strong warning from China  for Australia to stay out of the SCS dispute or risk damaging bilateral relations. Overall, the arbitration case and the ruling haven’t helped Australia’s interests. The case has highlighted Australia’s contradictory position with delimitation of its maritime boundaries with Timor-Leste and the ruling has thrown doubts  on the legitimacy of Australia’s claimed EEZ around some offshore features. It has also introduced further regional instability and new tensions in the China–United States bilateral relationship, as well as new divisive pressures within ASEAN, including fresh doubts  about the ability of ASEAN to deal with the situation in the SCS. Lastly, the ruling has opened up new questions  about just what constitutes the ‘rules-based global order’. Despite initial claims that the ruling would be a ‘game changer’  in the SCS, it likely won’t have any great lasting political or strategic impact on the region. It will remain of legal interest because of the criteria it established for determining whether offshore features are ‘islands’ or ‘rocks’. But even that’ll be prospective rather than retrospective – countries, including Australia, that have claimed EEZs from features which mightn’t be ‘fully entitled’ islands under the criteria used by the tribunal won’t be changing their claims. That was evident recently when the United States established the world’s largest marine protected area  in its EEZ around the Northwest Hawaiian Islands. Using the tribunal’s criteria, parts of that EEZ wouldn’t be legitimate, as some features on which it’s based wouldn’t qualify  as ‘fully entitled’ islands . It’s hard for Australia to criticise China for not abiding by the ruling. Timor-Leste has launched compulsory conciliation with Australia to try to get Australia to agree permanent maritime boundaries in the Timor Sea. But Australia’s Foreign Minister and Attorney-General have recently reaffirmed  that any report from the Commission won’t be binding. Timor-Leste missed an opportunity to make a point by not taking any position on the arbitral ruling on the SCS. Its position in its dispute with Australia might have supported a statement from Dili critical of China for not abiding by the rules, but that could have jeopardised its relations with China, a major source of its overseas aid. The ruling provides opportunities to go back to basics and start with ‘a clean sheet of paper’ in managing the SCS. Opportunities exist for negotiations between the parties . The focus of negotiations should now be on functional cooperation  for activities such as marine scientific research, fisheries management, protecting and preserving the marine environment, maritime law enforcement, and search and rescue. While calling for restraint by all parties to the SCS situation, Australia has policy options to help resolve the situation following the ruling. These include pursuing a carefully balanced and sensitive diplomatic approach with China, the United States and Southeast Asian countries to help promote cooperation and build trust. There’s also scope for Australia to contribute expertise to help develop regimes for the effective management of the SCS, particularly with the management of its fish stocks and the protection of its marine environment. There’s a tendency to exaggerate some of Australia’s interests in the SCS, particularly its dependence on freedoms of navigation  through the sea, but Australia does have legitimate interests in the region. Those provide the basis and justification for Australia to play an active role in efforts to maintain regional stability. There’s a bigger regional picture for Australia than the SCS. Sam Bateman is a professorial research fellow at the Australian National Centre for Ocean Resources and Security (ANCORS), University of Wollongong, and also an adviser to the Maritime Security Programme at the S. Rajaratnam School of International Studies (RSIS), Nanyang Technological University, Singapore. 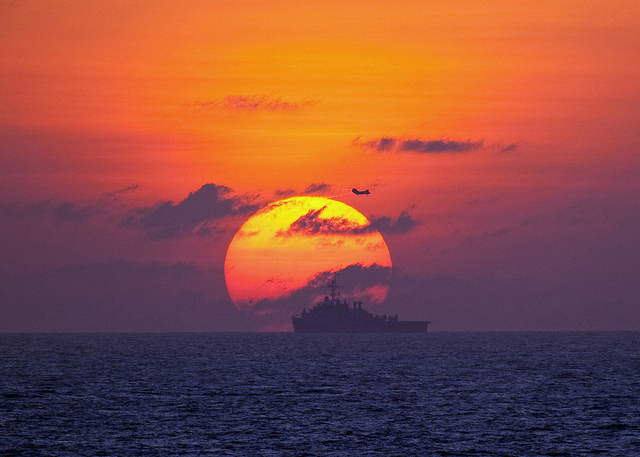 Image courtesy of Flickr user Naval Surface Warriors.